Absolutely do not watch this clip if offended by bad language. Viral video of the moment by Traveljunkie88. The venue was spectacular. I didn't realise you could throw a party on Tower Bridge. It is probably the best venue I have experienced. The choice of Tower Bridge had a lingering emotional trigger. Sue regularly walked across the bridge with her father when young and they used to say to each other, 'one day we'll have a party there.' Her old Dad is no longer around. I'm sure though he would have been proud as punch of his girl. Memorable party but she has set the bar rather high. I'm not sure how one follows that. The principle characteristic of salmon fishermen is one of optimism supported by patience and sanguine humour. Those qualities though are under duress after the worst start to the fishing season on many rivers in the UK since..... well forever, (although it must be mentioned that many more fishing days than average have been lost to bad weather conditions this year so far). The years preceding 2013 were bountiful but the salmon catch since has collapsed and salmon beats are now recording their worst five year averages since records began. Most of us have clung to the belief that the downtrend is cyclical in nature and will pick up again, as it did after very poor years in 1904 and 1915 for example. 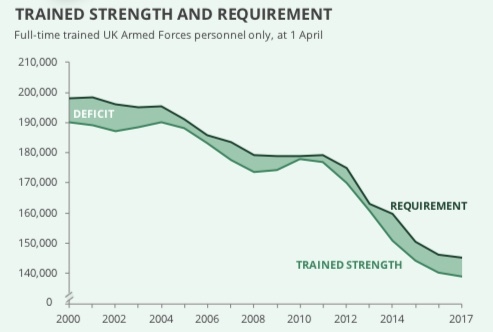 The precipitous and accelerating catch decline though is now causing deep anxiety rather than a concerned raise of the eyebrows. On most rivers, fisheries management is first class and despite grumpy complaints from fishermen about predatory birds such as cormorants and goosanders they alone cannot justify the decline in returning salmon. Nor can coastal and estuary netting, poaching or obstructions in the rivers, almost all of which have been eliminated. Seals remain a problem, having doubled in numbers around our coastline since 2000 but even they are not sufficient to explain what has happened. Mackerel spawning areas (purple shading) along the European shelf and the post-spawning and summer feeding migrations (purple arrows). The pre-2006 mackerel summer feeding areas are shown as dark green with the post-2006 expansion in light green - right where our young salmon head. The problem lies out at sea and debate rages whenever salmon fisherman get together about what the problem or problems could be. The answer is unlikely to be a simple one. More likely newly commissioned research will conclude that poor salmon survival rates at sea are the result of many complex and contributory factors. One scientist believes he has identified one factor and it is a whopper. Professor Jens Christian Holst suggests that the massive growth of the mackerel population, (and herring and blue whiting), in the North Atlantic, between the Faroes, Iceland and Norway has created unequal competition for food with young salmon losing out to vast millions of mackerel. The mackerel in turn have been pushed into these areas by an absence of plankton further south. There is some robust research available on the poleward migration of mackerel stock, most of it rather too academic for this post but if you wish to learn more it may be read here, here and here . A very good talk given by Professor Holst last year may be found here. So, with salmon fisherman in a melancholic if not glum mood what is to be done? Contrarians of course will look to purchase fishing at depressed prices waiting for them to rally but who know's when that might be. One thing is certain, the way to deplete mackerel stocks is to eat them so please, eat some bloody mackerel! Recent research has shown that almost all fish will survive if they are treated properly, according to a simple set of rules. Useful video should you be lucky enough to catch one, (and here’s another from Canada). Salmon fishermen are doing their bit within the limits of what is under their control. Virtually no fish are killed on the bank these days and in a complete reversal of historical habits well over 90% are returned and virtually 100% of the spring stock is returned on most if not all UK rivers. Catch and release is treated with near reverend religious devotion these days rather than as a 'good habit.' Many though incorrectly take the fish out of the water for a quick photograph before releasing. It is understandable that folk want a picture given catching the things is both an expensive and rare event but more and more people are frowning on it and many ghillies are encouraging catch and release from the net only without lifting the fish. "98% of people don't understand this" Matthew McConaughey's Motivational Speech. I am not usually one for motivational videos. Most are promulgated by ego driven self promoters who make motivational videos because they have failed at everything else. At best, they give us some strands of optimism to cling to or reassurance that we are doing some of the right things, whatever they are. At worst, they are deeply condescending and irritating. Occasionally, there are some points that give us pause for reflection which is never a bad thing. Here then are two, both very different. One from Matthew McConaughey which is typically American in being serious and sincere; the other from Australian Tim Minchin which is witty and irreverent. Reflect at your leisure. Epic bike ride, nine years ago now. Incredibly, it is nine years since the kids had a bash at, and completed, the 3 Peaks Challenge. That would have been interesting enough but of course they decided to cycle in between the three hills rather than drive which normal people do. It is rather a long way from Ben Nevis to Snowdon, especially when following bicycles in a support vehicle. Still, they cracked it and raised a healthy sum for charity along the way. They called it the Spatula Challenge, (from the movie Run Fat Boy Run), but the one who came up with the name, (the youngest), had to join me in the support vehicle for the duration. Oh what fun we had, setting up camp, striking camp, leap-frogging ahead of them every eight miles, waiting at the bottom of the hills in the rain with hot brews and doing running repairs to the bicycles. Worse than not knowing what I was doing, I thought I knew what I was doing so repair stops tended to linger somewhat. Funny how even with bikes you reassemble them and always have one mystery part left over. Anyway, the youngest has grown and does his own thing now and well done to him for cracking the London Marathon in his own Spatula Challenge. Some might suggest that running the marathon in a creditable four hours with minimal training in £26 training shoes from Sports Direct bordered on silliness but he gets a tick in my box for it. He did rather suffer somewhat the next day but hey, it's all for charity! 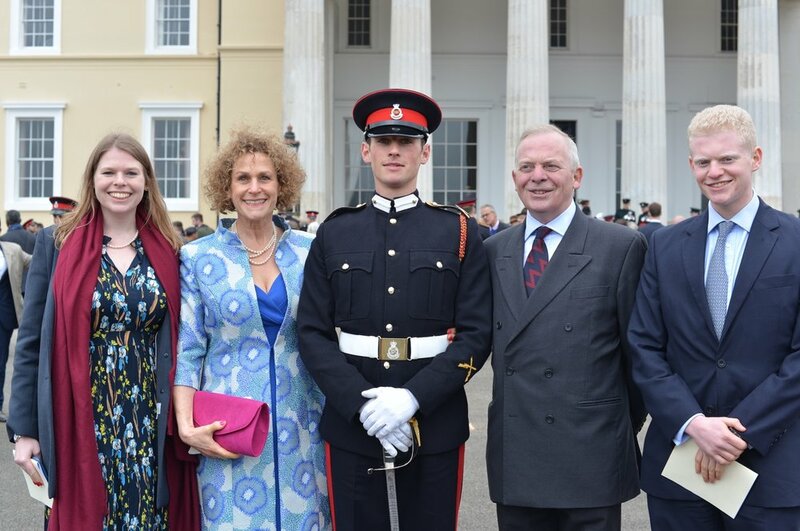 Two weeks ago the family turned out to attend the Sovereign's Parade at Sandhurst where Commissioning Course 172 had their big day eleven months after being dropped off with ironing boards and what seemed like several hundredweight of kit. A fabulous day it was too, as are they all for anyone passing out from a training establishment be they a recruit or an officer cadet. It was also my wedding anniversary. Days in life, never mind marriage, don’t come much better. In his address, the CGS, General Nick Carter, said to the assembled cadets that he would give his rank, his way of life, such material possessions that he has to swap places with any of the young men and women on parade for the opportunity to do it all over again. Thirty six years after my own Sovereigns Parade I was thinking exactly the same thing. I suspect every other person there over the age of forty was too. The day was not without a touch of circular sentimentality for me. When I passed out I did so with a fellow called Eddie Edmonstone next to me. Eddie went off to the Scots Guards while I went off to the Gunners. Today Eddie was there to see his Godson commission into the SG’s, as did my boy. Like many, I enjoy musical theatre. The very best musical theatre though is to be found on the drill square and none is bigger, better or more emotionally charged than is Old College Square at Sandhurst. It was, no ordinary anniversary. The weather today has had a distinctly autumnal rather than spring like feel. Where then is this global warming of which the clever people have lectured us for so long? Actually, they mostly got it wrong so now they speak of ‘climate change,’ which suggests to me they will claim any non-standard event as their domain thereby justifying their self-created industry of research grants, conferences, quango and NGO appointments. Along the way they have scared the bejesus out of a generation of school children and made millions while making millions feel guilty in going about their normal daily lives. Step out of line and criticise them and you are treated like a cross between a medieval heretic and a Brexit voter. Well they can mostly bugger off. I have never swallowed their conceited tripe and I’m not going to start now. Some scientists are suggesting that the circulation system of the North Atlantic is in its most weakened state seen for 1600 years. If you need something to worry about do read the article. My takeaway is that we have been force fed a diet for the last 20 years of made up scare stories, half-truths and misdirection promulgated by a collection of research grant hungry academics and gullible politicians preying on the natural anxieties of the populace to protect their children. It has though presented governments with a useful excuse to raise additional taxes. There may be some substance to some of the climate propaganda but I can’t help thinking we may all be looking in the wrong direction when we discover the real Inconvenient Truth – that we may have to worry a lot more in the Northern Hemisphere about cooling rather than warming. Why though interfere with our traditions established over centuries of being pathetically unprepared when a bad thing happens. Parts of America have just experienced the coldest April for 140 years. Indeed, parts of Northern Florida saw snow for the first time since 1899. I suspect that in the next few years the media will start to talk much more about Sun spot activity and its impact on our climate rather than CO2, (about which there is no hard evidence to prove it causes climate change). Few however will sit up and take notice until they see agricultural commodity prices rise in inverse correlation to the prices of farms in more northerly latitudes and for that matter, house prices. That though, will be many years in the future. Nonetheless, I would not be averse to maintaining a healthy stock of tinned food and extra fuel at home next winter; you never know. Wouldn’t it be a tad ironic of population migration did a 180 degree turn and northern Europeans started heading south? We all recall men or women of influence from our younger days. People who perhaps gave the right advice at the right time, who helped steer us on the right path or who bailed us out when things went astray. When then, all these years later we hear news of their passing we find ourselves being hurtled back to the memories of the heady exciting days of our younger selves. What days they were. What people we have known. One such figure in my life was Corporal Ronnie ‘Annie’ Oakley of the 1st Bn Royal Highland Fusiliers who recently passed after a short illness. The epitaph ‘Legend,’ has become so overused that it’s efficacy as a testament has come to be diluted. Not so in the case of Oakers. While every battalion has its list of ‘Regimental Legend’s,’ Ronnie was special and held in high regard by everyone who soldiered with him. 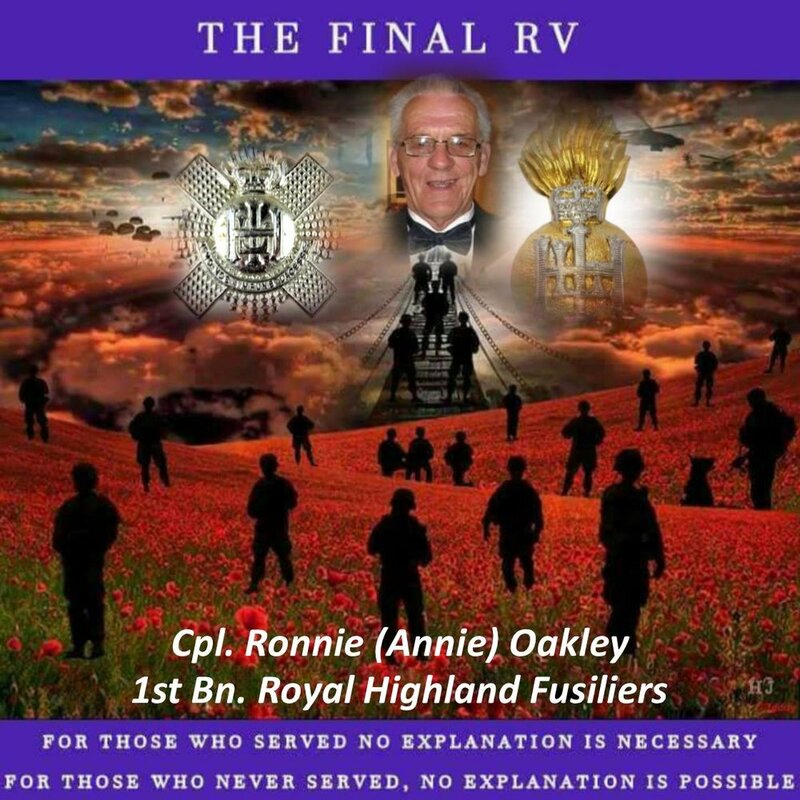 Meeting Ronnie with 1 RHF, then stationed in Barossa Barracks in Hemer, BAOR, was not part of my life plan. Far from it. But then plans have a way of unwinding at the first hurdle. Mine did when a premature stab at the Commissions Board at the age of 18 left me with what they called a ‘deferral.’ What they meant was ‘go away, grow up and come back and have another try.’ When I arrived back at my Depot at Glencorse near Edinburgh the only advice I received was from a Queens Own Highlander major who said, ‘why don’t you take a banana boat to China and see the world?’ He could have been speaking ancient Aramaic. Of course, he was suggesting I do what would now be called a gap year. I piped up and said ‘I would like to go to a battalion Sir.’ ‘Oh dear,’ he said, ‘I’ll speak to the Adjutant.’ The next morning I pulled my feet in and reported to the Adjutant, a Captain Ewan Loudon of the RHF. It was a short meeting. ‘Report to 1 RHF in Hemer on Monday morning,’ he said, ‘get your travel docs from the clerk.’ I walked out stirred, shaken and stunned. I had entertained delusional visions of going to Hong Kong with the Black Watch but here I was heading to 1 RHF. You see, the Royal Highland Fusiliers, recruited wholly from Glasgow and Ayrshire, did not just enjoy a fearsome reputation in the British Army, it held true within the Scottish Division itself. Chastising myself for being really very stupid and wondering how I would survive in the cauldron of the RHF while trying to hide the potential officer label threw me into despair. Sympathy beers from mates in the NAAFI that night served only to darken the mood. It really did feel like the end of days. As it transpired, my two years with 1 RHF was the most memorable and enjoyable time of my early life. I look back with great affection for the people I met, the life lessons I learned and the laughs we had. Those two years created the bedrock of my life in no small part thanks to the people around me. Men like Annie Oakley. Oakers joined the battalion in Fort George in 1969 by way of the Merchant Navy. They say that pressure makes diamonds. He was an orphan with no family so the Commanding Officer was his next of kin. The battalion was his family. It still is. (quotes in italics are from fellow RHF soldiers). Annie, (left) NI patrol base. Ronnie wasn’t just a good guy to know. He was a very, very good soldier. Some infantrymen get to where they need to be through hard training and application. Some get there through luck and blagging their way through training. Some though, are born to it. Was there ever a more natural infantry NCO than Ronnie? Ronnie wasn't quite cut out for a drill instructors course but no one instilled more confidence on the ground than did he, be it in urban or rural environments. A friend reminded the other day about Ronnie patrolling in the Ardoyne; he wouldn't let anyone turn a corner without first scanning the streets, windows and shoot-throughs with his bino's. They didn’t teach you to use bino's on street patrols at NITAT (Northern Ireland Training Advisory Team), but then NITAT didn't have Annie Oakley instructing there. He instilled confidence in all around him and was completely dependable when ‘on the job.’ As young Jocks, we all respected his soldiering skills and his judgement in the field. Gaining his respect for our abilities was an aspiration for us all. We got away with it but only because of Ronnie’s infectious charm and native wit. Being the straight man was easy given as soon as we walked on stage Ronnie had them eating out of his hand. 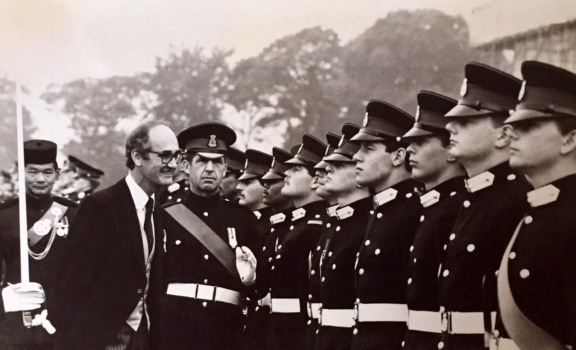 Ronnie died peacefully with close friends from the Battalion at his side. He planned his own well attended funeral even paying extra to have the crematorium service on a Saturday, ‘so folk didn’t have to take the day off work.’ That was typical of the man. He gave more than he took in life and that is the mark of a life well lived and of a gentleman. I shall remember him with affection, respect and genuine thanks for making my life a better one to live. He was the very best of men and soldiers that Scotland produces. Ex F1 driver Riccardo Patrese takes his wife round the Jerez circuit in a Honda Civic Type-R... a little too quickly! Hilarious!! After a blogging break of a month we're back and with a lot of catch-up posts to do. First, in salute of what must be the most melodic language in the world, here is a clip of Riccardo Patrese driving his wife around a circuit...... and what is there not to love about those Italian girls? My grandfather once said to me 'avoid fast women and slow horses.' I am reconsidering his advice. Heavens above! Get down from there Georgina.... this very instant! I'm not much one for High Street shopping, preferring like many, clicks to bricks and as a creature of habit I don't do many of those either. I have a small number of preferred suppliers to whom I return on a repeat basis, mostly buying exactly the same things when they wear out. Orvis is one, actually probably the main supplier and generally they are pretty good and often have ripping bargains for those who are minded to have a rummage through their digital sales stall. One particular favourite item of mine was the Zambezi trouser until it was discontinued a few years ago. I wasn't happy. I wrote to the CEO, 'Perk' Perkins who kindly dispatched someone to rummage around the warehouse and I was grateful to receive one of the last pairs. They have long since been worn out. So, I enjoyed a momentary uplift when they brought the line back and promptly ordered a pair. Just as promptly I returned them. They simply were not fit for my purpose. So, I wrote a review. The review was rejected. Do Orvis seriously consider Italian Hairdressers to be part of their natural constituency? Come on Orvis, get a grip.